Caption: Gazing at St. Lucia’s World Heritage landmark, The Pitons. But THAT depends on the hotel! I had a terrific time exploring St. Lucia, but more than once I thought of what awaited me back at SERENITY. My private suite. It had its own plunge pool with waterfall, a shaded patio with wet bar, a hammock for two, lounge chairs, and that was just the outside. Inside was a mahogany four-poster bed with a pillow menu! An oversized bath that was situated just so, with views of the outdoors, and the room. At the same time, it was private, for couples to do what they do, or for me to just be. When I asked what sets SERENITY apart from other luxury resorts on St. Lucia, CEO Mark Adams said, “The staff.” Adams explained that the turnover at both SERENITY and its sister resort Coconut Bay is very low. “The staff interaction with the guests, and with each other, is spontaneous and bonding.” The resort sets the stage, but the staff creates the guest experience. The SERENITY experience includes… Butler Service. I was told about “the butler” before boarding the Jet Blue flight from JFK directly to Hewanorra airport in St. Lucia. SERENITY at Coconut Bay is about a 10-minute drive from the airport. (Note: you gain precious vacation time by staying on the Atlantic side of the island.) In a sing-song voice, my butler gave me a tour of my suite. Thankfully, he explained just what a butler does at SERENITY. Here is the list! Unpack or pack your suitcase. This seemed slightly horrifying upon check-in. BUT I let him pack on my day of departure, which bought me more time on the in-pool lounger with a Pina Colada. 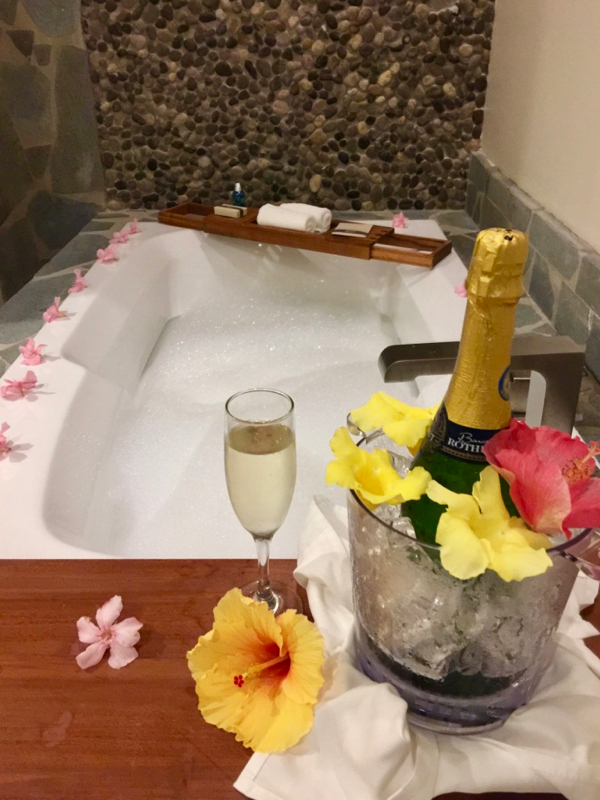 Draw a bath, a bath with hibiscus and plumeria flowers floating on bubbles, and a chilled bottle of Champaign portside. Fetch. Fetch sunscreen, insect repellant, towels. I took a spontaneous sunset swim forgetting a beach towel. I did, however, have my SERENITY pager/phone in my beach bag. I paged the butler, minutes later he arrived by golf cart, towels in hand. I attempted to make coffee in my room. Being machine challenged, I couldn’t figure out how the coffee maker worked. I called, “Good morning it’s your butler.” What would it be like to hear that greeting every morning? Could I get my husband to say that? And bring coffee too? 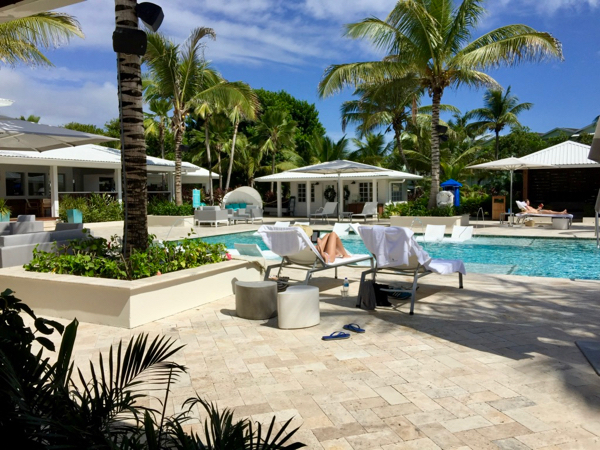 SERENITY guests have access to all of Coconut Bay’s resort facilities which include an 85-acre resort with seven bars, five pools, nine restaurants, spa, and a fitness facility. It’s situated on one mile of coastline. Sometimes you want wheels to access Coconut Bay’s fun stuff, and your butler can take you there. I should mention here, that SERENITY guests have butler service and access to Coconut Bay’s facilities. It does not work the other way around. At check-in, my butler asked me if I enjoyed any other alcohol libations besides, beer, wine or Champaign. I confessed, “Vodka, occasionally.” When I got back to my suite after lunch, I saw a tall bottle of Grey Goose on my outdoor bar. Adams, mentioned later, “that all a five (star) is, is that you’ve exceeded the guest’s expectation.” Here, the butler exceeded mine. Need a problem solver? Ask the butler. He managed a lock out (lost my key card), he took pictures (human selfie stick), he fixed my air conditioner (user error). A SERENITY guest is welcome to host a cocktail gathering in their suite. The menu, bartender, and music can be arranged through your butler. 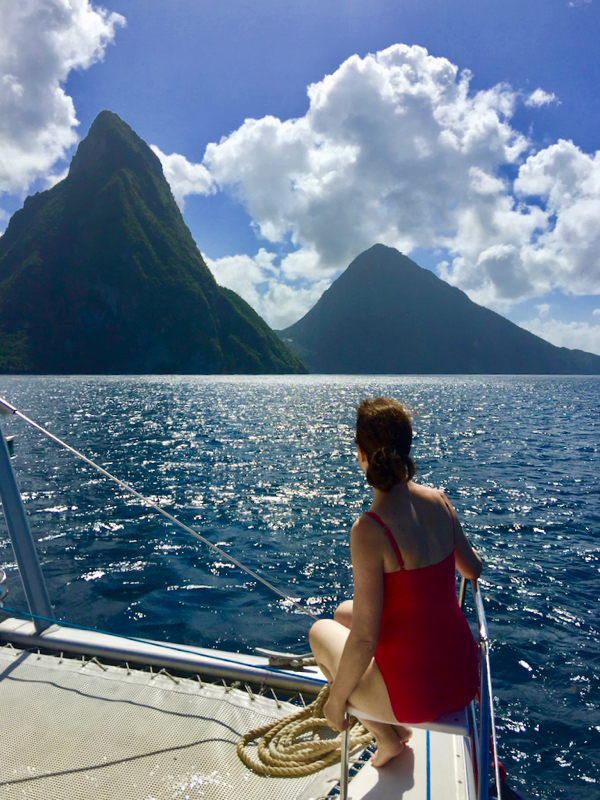 “Food is as much a star of St. Lucia as the Pitons, volcanic mud baths, fisherman, and everything you saw today.” Said Adams referring to our excursion away from SERENITY. “Do not miss the opportunity to experience a chef’s table dinner with Aunty Debbie at SERENITY.” True, we had an outstanding meal created by Aunty Debbie, who, in the 70’s was known throughout the island as a kind of St. Lucian Diana Ross. But the highlight of the evening was when Debbie sang a traditional island song to our table. Like the sunset I had seen earlier that evening, it was a sensory island experience unique to the Caribbean, wistful, romantic, timeless. My favorite meal while at SERENITY was at Coconut Bay. We sat down to a Brazilian style BBQ in a Robinson Crusoe-like ocean side outdoor longhouse. The meal began family style; Shrimp Paella, Andalusian Style Chicken, Patatas Bravas. Then it segued into meat on giant skewers; Herb Roasted Marinated Lamb, Spanish Style BBQ Top Round, and Honey Glazed Pork Tenderloin. The restaurant is aptly named, La Luna. That night the moon reflected dreamily on the water, and all was peaceful. Yet, during the Full Moon Party that Coconut Bay hosts monthly, a much different mood strikes. Bonfires blaze as a beach DJ provides pumping dance music. The floor show is on the ocean where illuminated kites dance over the water at the command of kiteboarders. Returning to SERENITY after the Full Moon Party or a long day of touring feels like coming home, but still five-star special. With just 36 suites, SERENITY at Coconut Bay is private and personalized. For loud music, crowds, kids, as well as some island adventure, you need to go beyond its boundaries. But you will be pining to get back to the elegance that is SERENITY. Kite surfers capturing Atlantic Ocean winds. Do consider taking kitesurfing lessons. 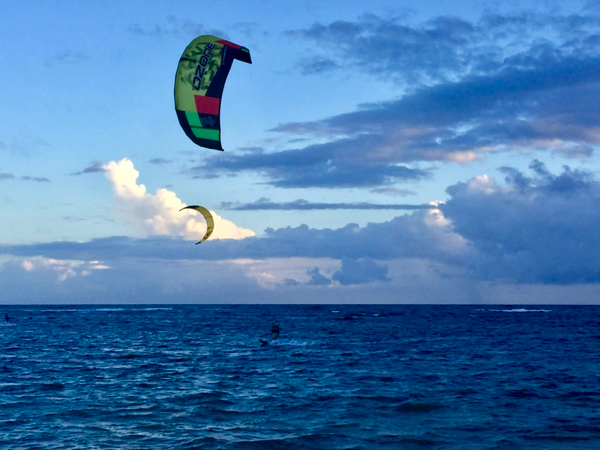 The Atlantic side of the island always has a breeze and St. Lucia is amongst the world’s best destinations for kitesurfing. Don’t hesitate to ask Chef Eric Vasson of SERENITY to make something especially for you. Do “Like” SERENITY at Coconut Bay’s Facebook page. Occasionally, there are some deals to be had. Don’t wear camo on St. Lucia. Law enforcement has exclusivity with that fashion. Do check out Jet Blue Getaways to find vacation packages to St. Lucia that include SERENITY at Coconut Bay. Don’t be upset if sargassum washes ashore during your stay. This is a natural occurrence and dependent on weather patterns. It goes with the flow and so should you! Fashion stylist and travel writer Cathie Arquilla’s love for travel is equal to her passion for fashion. As a travel writer, she inspires us to notice details, while telling us about what is new or ancient and fun to do. Formerly a celebrity stylist, Cathie now provides personal styling for clients at the CARLISLE Showroom in New York City. She is a contributor to Travelgirl magazine and GoNOMAD.com. Check out her website at cathiearquilla.com.